Humans have been exploiting honeybees for almost 9,000 years, according to archaeological evidence. Traces of beeswax found on ancient pottery from Europe, the Near East and North Africa suggest the first farmers kept bees. The research, published in Nature, shows our links with the honeybee date back to the dawn of agriculture. 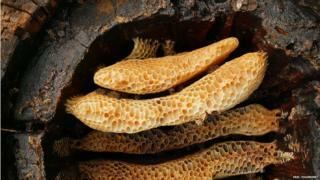 Prehistoric people may have domesticated wild bees or gathered honey and wax for medicines and food. Prof Richard Evershed of Bristol University, one of the lead scientists on the study, said: "We've got the earliest evidence for man's association with the honeybee. "Man is collecting the beeswax and the honey and perhaps even domesticating them." The honeybee has been part of human culture for centuries, appearing in cave paintings depicting honeycombs, swarms of bees and honey collecting. However, there has been little direct evidence of when and where ancient people began harvesting honey and wax from the insects. International scientists examined over 6,000 pottery vessels to piece together a map of the honeybee at a time when the world had just emerged from the last Ice Age about 10,000 years ago. Lifestyles were shifting from hunter-gathering towards growing the first crops and keeping animals for meat, milk and skin. The oldest evidence for human links with the honeybee, dating back almost 9,000 years, was found in what is now Turkey. By a few thousand years later, beeswax was detected across the Balkan peninsula, including Greece, Romania, Serbia, and then at sites occupied by early farmers in Central Europe. The first evidence for the use of bees in North Africa was also found around the same time. In the British Isles, the chemical fingerprint of bee products was found on broken pottery at Neolithic sites in southern England. The northerly limit appears to be Denmark, above which conditions may have been too harsh for bees to thrive. Ireland and Scotland also appeared to be off-limits to honeybees at the time. Prof Alan Outram of the University of Exeter, another lead researcher on the study, said until now there had been a poor understanding of the distribution of the species due to a patchy fossil record. He added: "Our study of the use of honey and beeswax seems to show there was a northern limit to where they were living during the Neolithic, with no evidence being found in thousands of pottery shards found in Ireland, Scotland, Norway or Sweden." The beeswax may have been used by prehistoric people to glue together stone arrows and spears or to make pots waterproof. Honey may have provided a rare source of sweetness in their diet. Prof Outram explained:"The plentiful supply of sugary foods is a very recent phenomenon, but in the past sweet foods were very hard to find and it is clear from our study that the earliest farmers in Europe had a keen interest in exploiting the valuable products of the honeybee." Recent DNA studies suggest that the honeybee originated in Asia around 300,000 years ago and rapidly spread across Europe and Africa. The bee's range contracted in Europe during the last Ice Age, but expanded in Africa. Modern bees face multiple threats from climate change, pesticides and diseases.